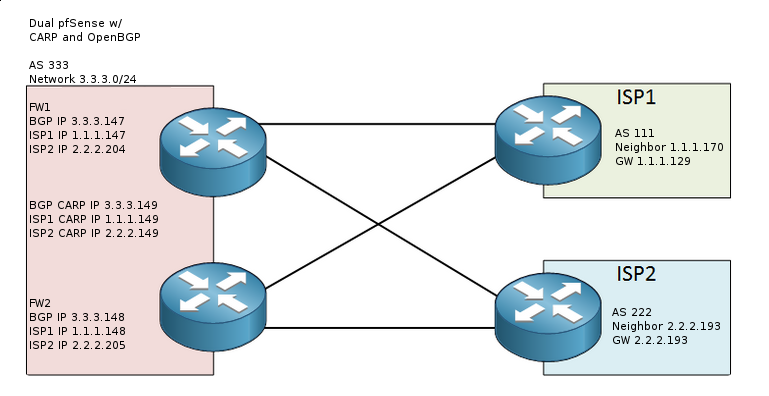 I am fairly new to BGP and am running into an issue. Does anyone have any ideas? Here is a basic sanitized diagram of my setup, a raw config, results from basic bgpctl commands, and the IRR record. I have a dual multi homed setup with 2 pfSense firewalls in failover mode using CARP. It has OpenBGP announcing our AS333 and block 3.3.3.0/24. It is working and we can hit systems on our block and outgoing shows the bgp ip as expected. I am trying to get it to be redundant in case one of the ISPs goes down. If I disconnect ISP1 I can still reach the our systems and they can still get out. If I disconnect ISP2 I I can no longer hit our systems and they can no longer get out. I have the default gateway in pfsense to be automatic and it does switch over to the other provider once it detects one of the ISPs down. I also have static routes configured for each neighbor to ensure it goes out the correct ISP for bgp updates. One of the things that seems off to me is under the 'bgpctl show rib' the route to the neighbor for ISP1 doesn't have > next to it so it makes it seem like its not active? The other thing I am unsure of is in that same route section it lists an origin AS 4444 that I have no idea where that comes from. I never entered that anywhere. Just a follow up, this is resolved. It was actually an issue with the provider that was not working. They had to update a MPLS record on their side. Once they did that, it worked as expected and fails over automatically.